We love hearing stories about the ways Lent Madness makes a difference, and we have quite a story to share today. 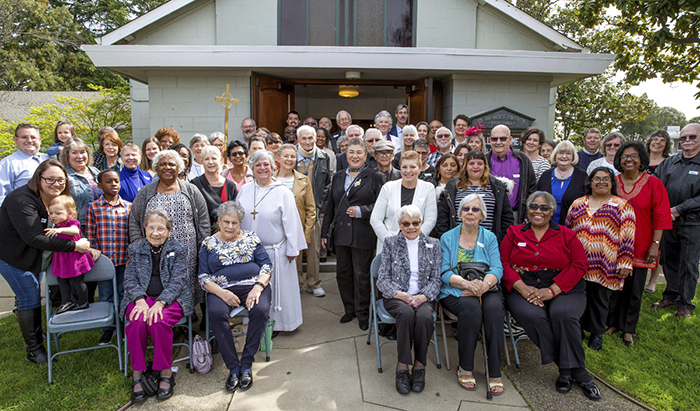 As you might have seen from coverage in Episcopal News Service, the Anglican Communion News Service, the Episcopal Cafe, or the Living Church, there’s a new church in California. Two Episcopal congregations merged, and they wanted to begin their new life together under a new name. Inspired by 2018 Golden Halo winner Anna Alexander, they have chosen to call themselves St. Anna’s Episcopal Church. Here’s the release their rector, the Rev. Jill Honodel, sent us. We at Lent Madness HQ pray that this new community has a flourishing ministry in which lives are transformed through the grace of Jesus Christ. With those words read by Canon to the Ordinary Abbott Bailey, the first Episcopal Church in the nation to be named after St. Anna Alexander was created. A community celebration is planned for July 21. Anna Ellison Butler Alexander is a new saint in the Episcopal tradition whose Feast Day is on September 24th and will be included in the next edition of Lesser Feasts and Fasts. She came to the attention of St. George’s, Antioch, and St. Alban’s, Brentwood, during last year’s Lent Madness, Forward Movement’s version of March Madness with saints “competing” in the brackets. St. Anna “won” the Golden Halo, six months before General Convention reaffirmed her sainthood in July. Born shortly after the Emancipation Proclamation in 1863, Anna Alexander devoted her life to the service of others by providing much needed education and literacy to the children of those formerly enslaved. Despite the segregation of the Episcopal Church at the time, she became the first African American Deaconess in the Episcopal Church. St. George’s of Antioch and St. Alban’s of Brentwood, which are near the epicenter of the real estate crash that impacted the nation in 2008, were hard hit. In 2018, they decided to not only share space in Antioch but also to share governance. On September 30th, the two mission churches officially petitioned to merge and reform into a new mission. The membership was unanimous in the decision. There is potential for a future church plant in Brentwood on a 9-acre property owned by the Diocese of California. The membership of the new St. Anna’s has done significant and heartfelt congregational work over the last two and a half years. Bishop Marc Andrus has been supportive of the congregations and their merging into one and naming themselves after the church’s newest saint. The mission statement of St. Anna’s is A diverse community celebrating God’s love and acceptance. 33 Comments to "Golden Halo Winner Inspires New Church Name"
This is a beautiful story. Prayers for the new church and its congregation! Congratulations to our new church. What a wonderful way to support St. Anna. I cannot say how wonderfully this has touched me! As Isaiah recounted God’s words, ‘Behold, I am making something new!’ God bless the community of St. Anna’s, as well as the clearly inspired ongoing ‘evangelical work’ of the Lent Madness Supreme Executive Committee! Wonderfully put! Blessings on St Anna’s! I’m not crying – something in my eye… Such a beautiful story – I wish the remarkable congregation of St. Anna’s a joy-filled and successful future! It’s clear that they will be an amazing resource in their community and the world! When people ask me “What does the Episcopal Church offer you?” I point to stories like this with equal doses of pride and humility. What a beautiful story. Thank you for sharing. This is my brother’s church! Really inspiring. Thanks Elaine (your brother) We are all pleased to be a merged congregation and taking the name of Anna Alexander. Our Bishop’s Warden was the only one to pick Saint Anna as the Golden Halo winner, but we all were on board with naming her OUR saint. Godspeed to all your new endeavours St. Anna’s. What a church should be. Prayers winging their way to you from Maryland’s Eastern Shore. This is why I am an Episcopalian – the combination of education and learning with love, inclusion, faith, and service. Hooray St. Anna’s! I will add you to my parish’s prayers for the people next Sunday. Jeanine, thank you for such a perfect description of the Episcopal Church and why we love it. The story of the new St. Anna’s Church is inspiring and heartwarming. May God bless them in all their works! May blessings be poured out on your congregation! How appropriate a patron she is for you! This is wonderful on all fronts! Fantastic! This story really lifts my spirits in a very tense and unpleasant time in our country. 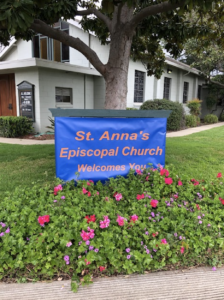 And yes, I am SO GRATEFUL I became an Episcopalian 15 years ago… Thanks be to God for the life and legacy of St. Anna, and may my home state of California enjoy this wonderful new church in its midst! Prayers for all who attend and support the new St. Anna’s Episcopal Church. Love from Maryland! This is the best story! Yay for St. Anna! I hope this very diverse congregation thrives and flourishes under the guidance of their honorable “new” patron. So proud of Lent Madness for bringing recognition to some of these lesser known saints. I echo your comments about Lent Madness, PatR – I learn so much, meet such engaging and interesting people, love Scott and Tim and admire their creativity, and it’s so much fun!! Thank you, Lent Madness and Forward Movement! How wonderful!!! I wish St Anna’s Episcopal Church many years of growth as they serve God! What a great story. I pray for many wonderful years of service and love for the new St. Anna’s. I am very moved by this story of the new church of St. Anna’s, not only because my name is Anna (I humbly put forth), but primarily because the new church is quite Diverse! I am active at Epiphany Episcopal Church, Odenton, MD, which is an intentionally and delightfully diverse parish. We, too, have an educational partnership with a local elementary school and the local Boys & Girls Club in our area! I would love to see some communication between these two parishes, so as to learn from each other, and explore ways to spread best practices for developing diverse parishes. Next email is to my Rector, The Rev Dr. Phebe L McPherson! Best wishes and prayers for St. Anna’s as you spread God’s Grace! Thanks be to God, Mazel too, and WOOHOO! Way to go parishioners, guests and neighbors. May our Lord Jesus Christ be always with you. This story has “Episcopal” written all over it! Blessings to you, St. Anna’s Church, and thank you for the good news and inspiration. Ditto Lent Madness SEC. Thank you all for the well wishes for St. Anna’s. It has been a long journey and as with many journeys there have been bumps along the way. We look forward to many years of serving our communities and growing into the church God has planned for us. What a beautiful story…I am so touched by this new beginning for St. Anna’s. I am so inspired by this story that as editor of the Seasonal Journal for Grace and St. Stephen’s Episcopal Church in Colorado Springs—also a church formed by the merging of two local Episcopal congregations (1923)—I plan to feature this new church, as well as our new saint, Saint Anna, in the Advent issue: a new saint, a new church, for a new liturgical year. I will request an Advent sermon from St Anna’s rector, as well as contributions form the Bishops of Georgia and California. By the way, our forthcoming Pentecost issue will have a sermon from Father Tim Schenck. Thank you,Lent Madness, for enlightening me! Thank you so much! I will pass this message along to our rector. Thank you, Michelle. I know it is early to be thinking of our Advent / Christmas / Epiphany issue, but the wonderful story of St Anna’s immediately inspired to think of the idea of connecting Advent with all I’ve written above. Blessings to your new combined congregations! Thank you everyone for your wonderful words and prayers. Our congregation is excited about moving into the future and seeing what God has in store for us. St. Anna is such an inspiration to us all! I believe with faith, hard work, and a desire to serve one can truly make a difference in ones community. We hope to do great things with her as our patron saint.